It is the most interesting information about Mother Motherland, Kiev. We hope you will enjoy your trip to the top of the monument. You will find more information about Kiev’s Mother-Motherland below. Interesting trip to the top of Kiev’s Mother Motherland! Only few people are aware of “Patriotic amusement” – an elevator in the Mother Motherland monument, which can take people up to the height of 92 meters. But how much does such ascent cost? The extreme enthusiasts will go directly to the Mother Motherland’s shield – there’s an observation desk here. By the way, this thrilling amusement was old-established, but it has been closed since 2003 because in 2003 some desperate 23-old guy jumped off the shield and smashed up. But residents of Kiev were literally besieging their mayor, demanding to open this amusement again – they said the people can get on the top of Eiffel Tower, which is 324 meters high, so why can’t they lift up on their “Iron Lady”? At the long last, the mayor let himself be talked into, and the elevators finally were opened. There will be two stops during the lifting to the shield. The first stop is situated on the deck, at a height of 36 meters. There are binoculars for observing the panorama. The mayor wanted to open a restaurant at this deck, like they did in Paris, but he hasn’t managed to find the investors. The second stop will be absolutely inevitable – people will have to leave vertical elevator and to move to the inclined one, which will move inside the hand of monument right to the shield. The whole trip will take about 30 minutes, including 10-15 minutes presence at the sky deck on the shield, where people can enjoy bird’s eye panorama of Kiev. 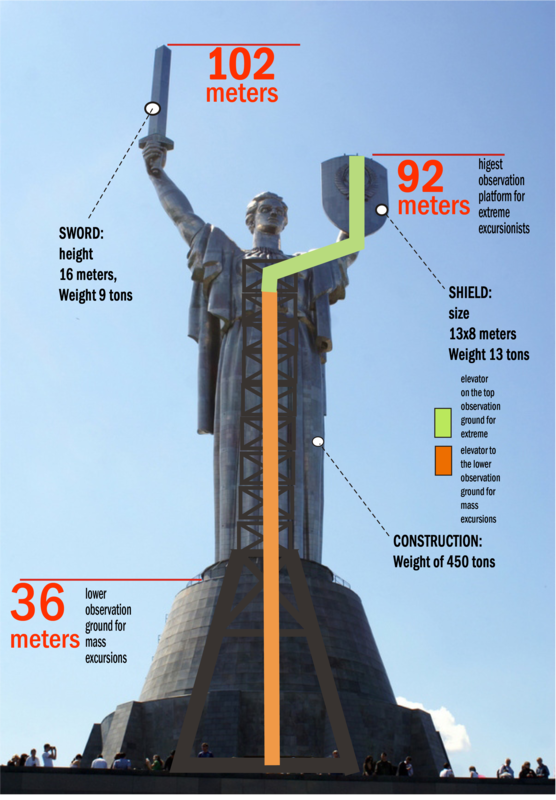 To get to 36-meters high deck will cost 50 hryvnas, to move to the very top of Kiev’s Motherland will cost 200 hryvnas. Be sure, you will really enjoy this exotic trip in Kiev. Also we can propose you many different excursions in Kiev with a trip to the top of Kiev’s Mother-Motherland! If you are interesting in it, please do not hesitate to contact us. The management of memorial has already armed the elevators; now they have to adjust only few things. Also they have worked out some safety measures – now nobody can jump off or fell off the monument, because there is high and solid fence everywhere. You may stay no more than two persons in shield at the same time! We kindly warn you concerning obligatory face control before going to the elevators – pregnant women, children under 12, elderly people and women wearing high-heels will not be admitted to this amusement. The stairs are steep between the elevators, and only fit people who wear suitable and comfortable shoes will be able to walk up. Also, for safety reasons, we will take to the elevator only two people at once. On the move of the elevator, the guide will tell you a history about this fantastic monument. You are welcome to contact Concierge Group and we will organize you the most pleasant and unforgettable impressions in Kiev.